The video argues that the Pro is "more powerful than most computers," and extremely versatile, being a "scanner, camera, editing suite, notepad, cinema, music studio, book, and a computer." Other bulletpoints include available LTE support, a simple interface, and the creative possibilities of the second-generation Apple Pencil. 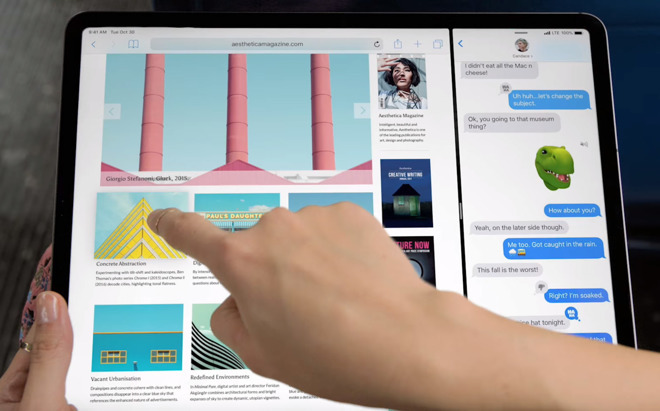 The ad's language is notably different from earlier iPad marketing, which tried to distance iPads from regular computers while competing with them at the same time. At one point the company referred to iPads as ushering in a "post-PC" era, and in November 2017 the company aired its infamous "What's a computer?" ad, often lampooned for being out of touch with reality. The new ad would seem to be a reversal, embracing the "computer" label in order to be seen as serious hardware. That approach is also reflected to an extent in the new Pro's design, since it now uses USB-C instead of Lightning, opening up compatible accessories. Not all USB-C accessories will work though, and iOS has yet to gain an open filesystem.